You are here: Home / Health / How To Choose A Yoga Trainer. How To Choose A Yoga Trainer. (ThyBlackMan.com) Have you ever found yourself in a place that you feel totally out of place? A place where you want to leave immediately you walk in? Life itself has its challenges and feeling like you do not fit in a yoga class should not be something you have to deal with. Your mental, physical and spiritual health decisions entirely lie with you, and you need to have the freedom to choose the right yoga trainer for you. Well, as a basic requirement, you will need to have the right yoga clothes before attending a yoga class; click here to see a variety you can choose from. 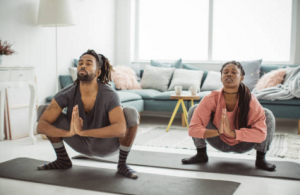 We all have reasons as to why we decide to start practicing yoga, it could be as a treatment for depression, for a general health-related reason or even to fine tune your body and so on. The best way to finding a yoga trainer who will meet your needs accordingly is first to understand your needs on a personal level. By doing this, the trainer can quickly know the type of yoga exercises that will be the best fit for you. Typically, the yoga trainer will come up with several exercises for you to choose from and will only incorporate the ones that you consent to. Finding a yoga trainer might sound like an easy task until you get down to it. Yes, there are many trainers out there but how many are qualified to offer the services to you? You need to do your due diligence by doing proper research before choosing one. You could ask around to find out the trainers that have a good track record. Also, you can make use of the reviews left behind about various yoga trainers on the web before deciding on the one to take you through your sessions. How well you will be able to relate directly with your trainer has a significant effect on how successful your sessions will be. Can you imagine working with a trainer who is always gloomy and answers your questions rudely? For sure, no one would want such an experience. After identifying a yoga trainer either through referrals or reviews, you can go ahead and give them a call to inquire about one or two things. How they respond to the same will help you gauge if you can work with them or not. Significantly more, you can arrange a one on one meeting with them for you to see if you can connect with them. We all have many responsibilities that require some funds on a daily, and we always look for the best options to save up some money. Therefore, when deciding on which trainer to work with, request for a quotation from them as it will enable you to see if you will be able to pay up. Also, ask them if they have payment options such as paying in installments for planning purposes.